As a world-class metropolitan city, Bangkok is more than a tourist destination. Many people come from all corners of the globe for business, employment and many other purposes. 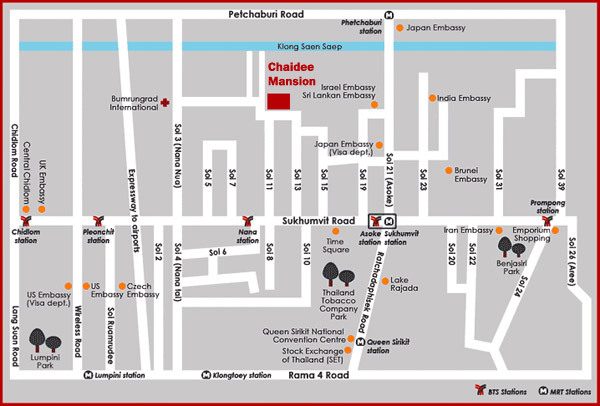 If you are planning an extended stay in the Kingdom, you can rent a fully furnished apartment at Chaidee Mansion. Living in Sukhumvit Soi 11 has many advantages. World class restaurants and shopping are close at hand, along with almost everything else Bangkok has to offer: top quality schools, hospitals, nightlife, and more. If you are planning an extended stay, please contact us directly to let us know of your requirements and time frames. We will be happy to respond to you directly with suitable choices of accommodations, and prices that reflect the duration of your stay in Chaidee mansion.